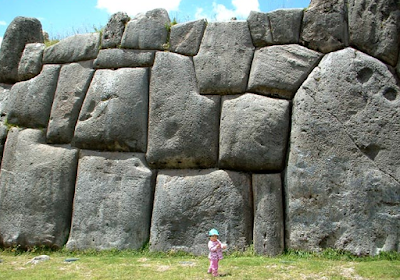 That adorable little tyke is standing adjacent to an inexplicably ginormous wall that is part of an ancient and anomalous Incan site located near the city of Cusco, known as Sacsayhuaman. The scholars over at World Mysteries have posted a bloody-fine essay on this cyclopean architectonic wonder, and we encourage you to delve into it. And for the bewildered layman who admiringly lets out a whistle and wonders aloud: “I wonder how they were able to build it back then...” it is not insignificant to point out that it isn’t all that clear how anyone would go about building Sacsayhuaman right now. Some of the boulders that constitute this mysterious monolithic masterpiece tip the scales at over 200,000 pounds. Simply put, there isn’t a crane, a contraption, or a piece of technology on the planet that could budge chunks of granite this size more than an inch; let alone deftly manipulate them into their perplexing, jig-saw puzzle-like arrangement.